When I was shopping in the Vogue Knitting online store (using up my gift certificate that was part of my conference package last fall), I selected this book just based on the cover. Okay, so I peaked at the patterns on Ravelry before I completed the order, but I thought that the designs looked stunning. I don't know much about Brioche knitting but I thought that Knitting Fresh Brioche: Creating Two-Color Twists & Turns by Nancy Marchent might give me insight into a new technique. I expected that Brioche knitting would be similar to the Knit one Below technique but the lines here flow and twist to create more than just vertical stripes. This is a whole new world with new terminology. Thank goodness the book had a hefty tutorial section with full color step by step photographs for these techniques. The first 50 pages of this book are teaching you HOW to brioche. I imagine I will also have to watch some videos but it is not the fault of Marchant, sometimes I personally learn easier when I can see someone do it. This is super a fantastic resource to have in hand as I attempt to try something new! Since the charts have completely different symbols, it is helpful to have multiple pages dedicated on how to read them. Knitting Fresh Brioche is a stitchionary in addition to a learn to Brioche and pattern book. Each of the stitch motifs are shown with color photographs of the RS and WS of the fabric, written instructions and charts. The stitches have twists and turns like organic roots flowing through soil. I am mesmerized looking at the patterns and can't wait to have the chance to try swatching out some of these designs. I had an epic failure when I tried to make some mosaic mittens. I am sad to say that I quit working on this project entirely. I was fine until the increases on the thumb started and I had to keep track of where to put them in my head since the chart accommodated a few different sizes. It probably would have gone better had I recharted the sections I wanted to make. With a shawl or scarf I might have better luck trying out a complex slip stitched colorwork design. Brioche seems much more complex on the outset but I think it only feels that way because I haven't tried it yet. All of the patterns in this book are scarves and shawls because Marchant's stitch designs really almost design an entire neck wrap themselves. All of the stitch samples were done in the same two colors, so now Marchant knit samples in different fiber types, weights and colors to show how much variety you can get out of these beautiful stitches. All patterns have both written instructions and charts. I really appreciate that there are both male and female models showing off the garments. You might think that all of these flowy winding patterns look feminine but they are also a much more interesting version of a striped pattern. I think that Keith might end up with one of these coming his way! I love finding new crafts and techniques to experiment with. 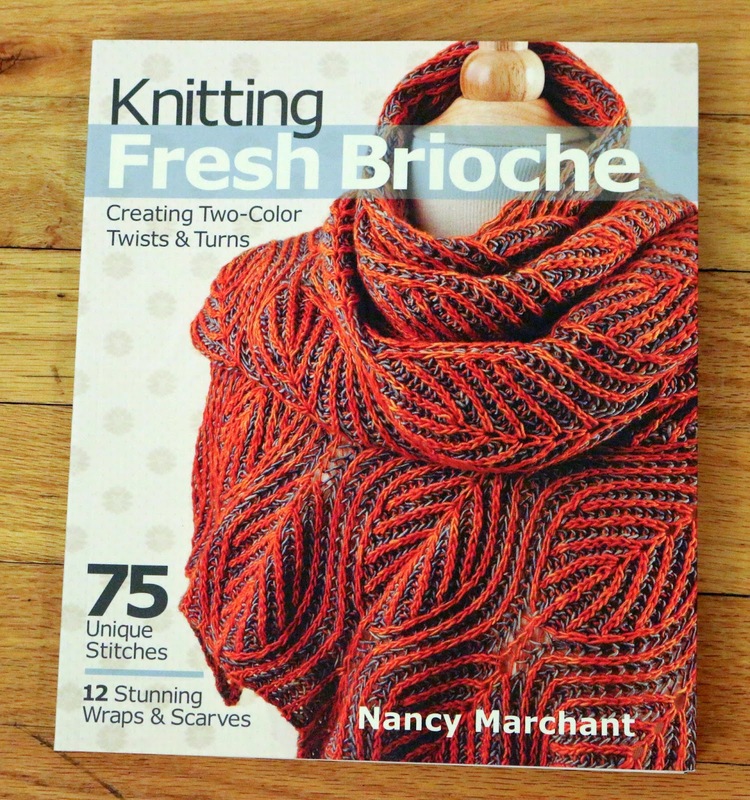 I cannot wait to try out Knitting Fresh Brioche and am super excited to use Marchant as my teacher. I know that with her book I'll create something beautiful. I took her Craftsy class and loved it. Oooo Fun! I've never taken a craftsy class but I would like to in the future.